A metal-based gun has been printed using a 3D printer for the first time. The pistol was made by Solid Concepts. The company is a 3D printing service based in Austin, Texas. The pistol itself is a copy of the 1911 original designed by John Browning. 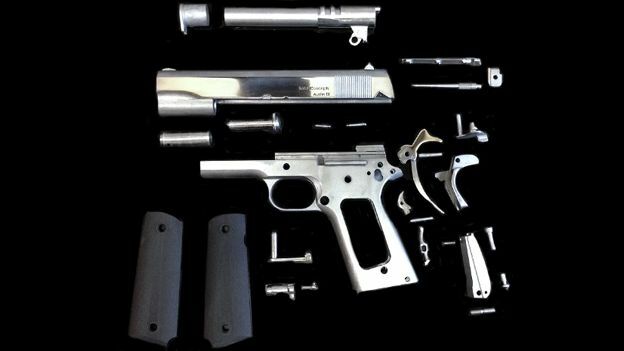 Almost every part of the gun was created by through a technique called direct metal laser sintering (DMLS). It is an industrial 3D printing process used by aerospace and surgical companies to make precise metal parts. Only the gun's metal springs were made seperately. “When we decided to go ahead and make this gun, we weren't trying to figure out a cheaper, easier, better way to make a gun,” said Phillip Conner, project manager, in a video. "That wasn't the point at all. Solid Concepts has said that it can print any specialised gun part in five days. However, it is unlikely the plans will be released to the general public. The company itself holds a Federal Firearms Licence, enabling it to manufacturer guns. The gun has rekindled concerns that criminals will be able to create unregistered weapons. However, the company dismissed this. It said that it would be impossible to replicate the gun using anything less than a 3D metal printer. Such printers start at $10,000. “The industrial printer we used costs more than my college tuition (and I went to a private university) and the engineers who run our machines are top of the line; they are experts who know what they're doing and understand 3D printing better than anyone in this business,” said Alyssa Parkinson, a spokesperson for Solid Concepts, in a blog post.